UL, CSA, and NSF safety standards, this new generation of sake warmer units boast, enhance, quick, heating capacity with new dispensing rate and other new features. UL, CSA, and NSF safety standards, this new generation of sake warmer units	boast, enhance heating capacity with new dispensing rate and other new features. Choose from 17 different models to serve your needs. Custom colors are available. Please contact us for more details. - Tested by ETL to meet UL, CSA and NSF standard requirements. - Utilizing the traditional method of heating sake in a hot waterbath, these sake warmers gently heat sake at the same rate as hot water, preserving the delicate and natural flavor of sake. 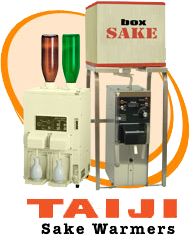 - Comes with the Automatic Shut-Off valve, which allows sake bottles to be filled without direct supervision. - Easy temperature control with automatic shut off valve. - Includes a one year manufacturer's warranty. - Also, available in cruise ship and European voltages of 220/240V.